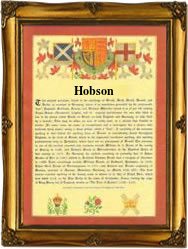 This ancient English surname recorded as Hobson, Hopson, Hobbes, Hobbs and Hobbiss, and other spellings, is a patronymic form of the medieval male name Hobb, itself a pet form of Robert. Robert derives from the pre 8th century Anglo-Saxon or Germanic "Hrodbeorht", a compound personal name with the elements "hrod" meaning "renown", plus "berht", bright or famous. The name was probably introduced into England during the reign of King Edward, known as The Confessor, 1042 - 1066, but took hold after the Norman Conquest of 1066. Rodbertus, Rotbert, and Robert, (without surname), are all recorded in the famous Domesday Book of 1086. The popularity of the name subsequently gave rise to a wide variety of "nicknames" including Rob, Dob, Hob, and many others and these developed into surnames in their own right. The patronymic form with "son" or simply the "s", emerged in the early 14th Century. Early examples of the recordings include Robertus Hobson, in the 1379 Poll Tax rolls of Yorkshire, whilst Edward Hobson,who embarked from London in 1619 on the ship "Bona Nova", was one of the first settlers in the state of Virginia. The first recorded spelling of the family name is believed to be that of John Hobbessone, which was dated 1327, in the Subsidy Rolls of the county of Essex, during the reign of King Edward 111 of England, who reigned from 1327 to 1377.